An atom becomes a positive ion whenever it loses an electron, and has an overall positive charge. Conversely, whenever an atom acquires an extra electron, it becomes a negative ion and has a negative charge. Due to normal molecular activity, there are always ions present in any material. If the number positive ions and negative ions is equal, the material is electrically neutral. When the number positive ions exceeds the number negative ions, the material is positively charged. The material is negatively charged whenever the negative ions outnumber the positive ions. Since ions are actually atoms without their normal number electrons, it is the excess or the lack electrons in a substance that determines its charge. In most solids, the transfer charges is by movement electrons rather than ions. The transfer charges by ions will become more significant when we consider electrical activity in liquids and gases. At this time, we will discuss electrical behavior in terms electron movement. Q14. What is the electrical charge an atom which contains 8 protons and 11 electrons? One the fundamental laws electricity is that LIKE CHARGES REPEL EACH OTHER and UNLIKE CHARGES ATTRACT EACH OTHER. A positive charge and negative charge, being unlike, tend to move toward each other. In the atom, the negative electrons are drawn toward the positive protons in the nucleus. This attractive force is balanced by the electron's centrifugal force caused by its rotation about the nucleus. As a result, the electrons remain in orbit and are not drawn into the nucleus. Electrons repel each other because their like negative charges, and protons repel each other because their like positive charges. The law charged bodies may be demonstrated by a simple experiment. Two pith (paper pulp) balls are suspended near one another by threads, as shown in figure 1-6. Figure 1-6. - Reaction between charged bodies. If a hard rubber rod is rubbed with fur to give it a negative charge and is then held against the right- hand ball in part (A), the rod will give f a negative charge to the ball. The right-hand ball will have a negative charge with respect to the left-hand ball. When released, the two balls will be drawn together, as shown in figure 1-6(A). They will touch and remain in contact until the left-hand ball gains a portion the negative charge the right-hand ball, at which time they will swing apart as shown in figure 1-6(C). If a positive or a negative charge is placed on both balls (fig. 1-6(B)), the balls will repel each other. The relationship between attracting or repelling charged bodies was first discovered and written about by a French scientist named Charles A. Coulomb. Coulomb's Law states that CHARGED BODIES ATTRACT OR REPEL EACH OTHER WITH A FORCE THAT IS DIRECTLY PROPORTIONAL TO THE PRODUCT THEIR INDIVIDUAL CHARGES, AND IS INVERSELY PROPORTIONAL TO THE SQUARE THE DISTANCE BETWEEN THEM. The amount attracting or repelling force which acts between two electrically charged bodies in free space depends on two things - (1) their charges and (2) the distance between them. The space between and around charged bodies in which their influence is felt is called an ELECTRIC FIELD FORCE. It can exist in air, glass, paper, or a vacuum. ELECTROSTATIC FIELDS and DIELECTRIC FIELDS are other names used to refer to this region force. Fields force spread out in the space surrounding their point origin and, in general, DIMINISH IN PROPORTION TO THE SQUARE THE DISTANCE FROM THEIR SOURCE. The field about a charged body is generally represented by lines which are referred to as ELECTROSTATIC LINES FORCE. These lines are imaginary and are used merely to represent the direction and strength the field. To avoid confusion, the lines force exerted by a positive charge are always shown leaving the charge, and for a negative charge they are shown entering. Figure 1-7 illustrates the use lines to represent the field about charged bodies. Figure 1-7. - Electrostatic lines force. Figure 1-7(A) represents the repulsion like-charged bodies and their associated fields. Part (B) represents the attraction unlike-charged bodies and their associated fields. Q15. What is the relationship between charged bodies? Q16. What is an electrostatic field? Q17. In what direction are electrostatic lines force drawn? In order to properly understand the principles electricity, it is necessary to study magnetism and the effects magnetism on electrical equipment. Magnetism and electricity are so closely related that the study either subject would be incomplete without at least a basic knowledge the other. Much today's modern electrical and electronic equipment could not function without magnetism. Modern computers, tape recorders, and video reproduction equipment use magnetized tape. High-fidelity speakers use magnets to convert amplifier outputs into audible sound. Electrical motors use magnets to convert electrical energy into mechanical motion; generators use magnets to convert mechanical motion into electrical energy. Q18. What are some examples electrical equipment which use magnetism? Magnetism is generally defined as that property a material which enables it to attract pieces iron. A material possessing this property is known as a MAGNET. The word originated with the ancient Greeks, who found stones possessing this characteristic. Materials that are attracted by a magnet, such as iron, steel, nickel, and cobalt, have the ability to become magnetized. These are called magnetic materials. Materials, such as paper, wood, glass, or tin, which are not attracted by magnets, are considered nonmagnetic. Nonmagnetic materials are not able to become magnetized. Q19. What are magnetic materials? The most important group materials connected with electricity and electronics are the ferromagnetic materials. Ferromagnetic materials are those which are relatively easy to magnetize, such as iron, steel, cobalt, and the alloys Alnico and Permalloy. (An alloy is made from combining two or more elements, one which must be a metal). These new alloys can be very strongly magnetized, and are capable obtaining a magnetic strength great enough to lift 500 times their own weight. Magnetic stones such as those found by the ancient Greeks are considered to be NATURAL MAGNETS. These stones had the ability to attract small pieces iron in a manner similar to the magnets which are common today. However, the magnetic properties attributed to the stones were products nature and not the result the efforts man. The Greeks called these substances magnetite. The Chinese are said to have been aware some the effects magnetism as early as 2600 B.C. They observed that stones similar to magnetite, when freely suspended, had a tendency to assume a nearly north and south direction. Because the directional quality these stones, they were later referred to as lodestones or leading stones. Natural magnets, which presently can be found in the United States, Norway, and Sweden, no longer have any practical use, for it is now possible to easily produce more powerful magnets. Q20. What characteristics do all ferromagnetic materials have in common? Magnets produced from magnetic materials are called ARTIFICIAL MAGNETS. They can be made in a variety shapes and sizes and are used extensively in electrical apparatus. Artificial magnets are generally made from special iron or steel alloys which are usually magnetized electrically. The material to be magnetized is inserted into a coil insulated wire and a heavy flow electrons is passed through the wire. Magnets can also be produced by stroking a magnetic material with magnetite or with another artificial magnet. The forces causing magnetization are represented by magnetic lines force, very similar in nature to electrostatic lines force. Artificial magnets are usually classified as PERMANENT or TEMPORARY, depending on their ability to retain their magnetic properties after the magnetizing force has been removed. Magnets made from substances, such as hardened steel and certain alloys which retain a great deal their magnetism, are called PERMANENT MAGNETS. These materials are relatively difficult to magnetize because the opposition refered to the magnetic lines force as the lines force try to distribute themselves throughout the material. The opposition that a material refers to the magnetic lines force is called RELUCTANCE. All permanent magnets are produced from materials having a high reluctance. RESIDUAL MAGNETISM. The ability a material to retain an amount residual magnetism is called the RETENTIVITY the material. The difference between a permanent and a temporary magnet has been indicated in terms RELUCTANCE, a permanent magnet having a high reluctance and a temporary magnet having a low reluctance. Magnets are also described in terms the PERMEABILITY their materials, or the ease with which magnetic lines force distribute themselves throughout the material. A permanent magnet, which is produced from a material with a high reluctance, has a low permeability. A temporary magnet, produced from a material with a low reluctance, would have a high permeability. Q21. What type magnetic material should be used to make a temporary magnet? The magnetic force surrounding a magnet is not uniform. There exists a great concentration force at each end the magnet and a very weak force at the center. Pro this fact can be obtained by dipping a magnet into iron filings (fig. 1-8). It is found that many filings will cling to the ends the magnet while very few adhere to the center. The two ends, which are the regions concentrated lines force, are called the POLES the magnet. Magnets have two magnetic poles and both poles have equal magnetic strength. Figure 1-8. - Iron filings cling to the poles of a magnet. If a bar magnet is suspended freely on a string, as shown in figure 1-9, it will align itself in a north and south direction. When this experiment is repeated, it is found that the same pole the magnet will always swing toward the north magnetic pole the earth. Therefore, it is called the north-seeking pole or simply the NORTH POLE. The other pole the magnet is the south-seeking pole or the SOUTH POLE. Figure 1-9. - A bar magnet acts as a compass. A practical use the directional characteristic the magnet is the compass, a device in which a freely rotating magnetized needle indicator points toward the North Pole. The realization that the poles a suspended magnet always move to a definite position gives an indication that the opposite poles a magnet have opposite magnetic polarity. Like poles repel, unlike poles attract. Q23. How does the law magnetic poles relate to the law electric charges? The fact that a compass needle always aligns itself in a particular direction, regardless its location on earth, indicates that the earth is a huge natural magnet. The distribution the magnetic force about the earth is the same as that which might be produced by a giant bar magnet running through the center the earth (fig. 1-10). The magnetic axis the earth is located about 15° from its geographical axis thereby locating the magnetic poles some distance from the geographical poles. The ability the north pole the compass needle to point toward the north geographical pole is due to the presence the magnetic pole nearby. This magnetic pole is named the magnetic North Pole. However, in actuality, it must have the polarity a south magnetic pole since it attracts the north pole a compass needle. The reason for this conflict in terminology can be traced to the early users the compass. Knowing little about magnetic effects, they called the end the compass needle that pointed towards the north geographical pole, the north pole a compass. With our present knowledge magnetism, we know the north pole a compass needle (a small bar magnet) can be attracted only by an unlike magnetic pole, that is, a pole south magnetic polarity. Figure 1-10. - The earth is a magnet. A popular theory magnetism considers the molecular alignment the material. This is known as Weber's theory. This theory assumes that all magnetic substances are composed tiny molecular magnets. Any unmagnetized material has the magnetic forces its molecular magnets neutralized by adjacent molecular magnets, thereby eliminating any magnetic effect. A magnetized material will have most its molecular magnets lined up so that the north pole each molecule points in one direction, and the south pole faces the opposite direction. A material with its molecules thus aligned will then have one effective north pole, and one effective south pole. An illustration Weber's Theory is shown in figure 1-11, where a steel bar is magnetized by stroking. When a steel bar is stroked several times in the same direction by a magnet, the magnetic force from the north pole the magnet causes the molecules to align themselves. Figure 1-11. - Weber's molecular theory magnetism. Q25. 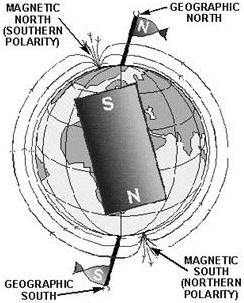 Using Weber's molecular theory magnetism, describe the polarity the magnetic poles produced by stroking a magnetic material from right to left with the south pole a magnet. A more modern theory magnetism is based on the electron spin principle. From the study atomic structure it is known that all matter is composed vast quantities atoms, each atom containing one or more orbital electrons. The electrons are considered to orbit in various shells and subshells depending upon their distance from the nucleus. The structure the atom has previously been compared to the solar system, wherein the electrons orbiting the nucleus correspond to the planets orbiting the sun. Along with its orbital motion about the sun, each planet also revolves on its axis. It is believed that the electron also revolves on its axis as it orbits the nucleus an atom. It has been experimentally proven that an electron has a magnetic field about it along with an electric field. The effectiveness the magnetic field an atom is determined by the number electrons spinning in each direction. If an atom has equal numbers electrons spinning in opposite directions, the magnetic fields surrounding the electrons cancel one another, and the atom is unmagnetized. However, if more electrons spin in one direction than another, the atom is magnetized. An atom with an atomic number 26, such as iron, has 26 protons in the nucleus and 26 revolving electrons orbiting its nucleus. If 13 electrons are spinning in a clockwise direction and 13 electrons are spinning in a counterclockwise direction, the opposing magnetic fields will be neutralized. When more than 13 electrons spin in either direction, the atom is magnetized. An example a magnetized atom iron is shown in figure 1-12. Figure 1-12. - Iron atom. Q26. What is the difference between the domain theory and Weber‘s theory magnetism? The space surrounding a magnet where magnetic forces act is known as the magnetic field. A pattern this directional force can be obtained by performing an experiment with iron filings. A piece glass is placed over a bar magnet and the iron filings are then sprinkled on the surface the glass. The magnetizing force the magnet will be felt through the glass and each iron filing becomes a temporary magnet. If the glass is now tapped gently, the iron particles will align themselves with the magnetic field surrounding the magnet just as the compass needle did previously. The filings form a definite pattern, which is a visible representation the forces comprising the magnetic field. Examination the arrangements iron filings in figure 1-13 will indicate that the magnetic field is very strong at the poles and weakens as the distance from the poles increases. It is also apparent that the magnetic field extends from one pole to the other, constituting a loop about the magnet. Figure 1-13. - Pattern formed by iron filings. Q27. Refer to figure 1-13. For what purpose would you sprinkle iron filings on the glass plate? Q28. Refer to figure 1-13. What pattern would be formed if sawdust was sprinkled on the glass instead iron filings? To further describe and work with magnet phenomena, lines are used to represent the force existing in the area surrounding a magnet (refer to fig. 1-14). These lines, called MAGNETIC LINES FORCE, do not actually exist but are imaginary lines used to illustrate and describe the pattern the magnetic field. The magnetic lines force are assumed to emanate from the north pole a magnet, pass through surrounding space, and enter the south pole. The lines force then travel inside the magnet from the south pole to the north pole, thus completing a closed loop. Figure 1-14. - Bar magnet showing lines of force.